Browse: Home / 2013 / May / And where are you in transit to? It seems that not too many people show up in Perth at 6am claiming to be in transit. For me, however, this was the fourth immigration checkpoint in the preceding 4 days where that was the case. I had cleared immigration in Doha and Bangkok and remained in transit in Yangon (I’m still not entirely sure how I pulled that one off) and now it was time to play the same game in Australia. I tried to use the eGates, knowing that my passport doesn’t have the RFID chip so it would fail. On the plus side, that got me to the front of the line to speak with the officer. Her: It says here you are in transit. Where are you in transit to? Me: <internal voice>Ruh-roh</internal voice>Oh, right…so tired from that redeye flight. My next stop is Jo’burg, South Africa. Her: Hmm….well, I suppose there is no good way to get to South Africa, huh? 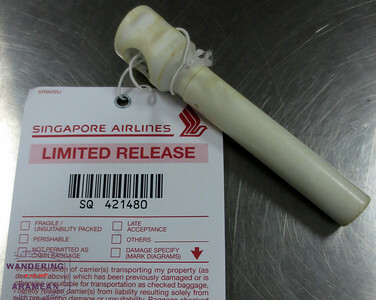 Her: Have a safe flight. I suppose that could have been worse, though remembering where I am and where I’m going clearly starts to suffer as the trip progresses. My plan for Perth was mostly that I didn’t have a plan. I had booked a rental car and I had dinner reservations at 6:30pm with a former co-worker. That left me with about 12 hours to explore the area and try to avoid any further awkward moments with law enforcement officers. I had considered trying to make the drive out to the wine country outside of town but too many people told me that would take up too much time. As I headed in towards town in the rental car I saw a road sign pointing towards Fremantle. That was also on my list of possibilities as a cute beach town to visit. And here it was, easily accessible. It seems my plan was starting to come together. Most of my day was ultimately spent in and around Fremantle. I explored the waterfront area, lamented that I was there at 8am as the local brewery was not yet open and generally was lazy. Sometimes that’s the best way to “explore” a town. That’s not to say I didn’t get out and see anything. 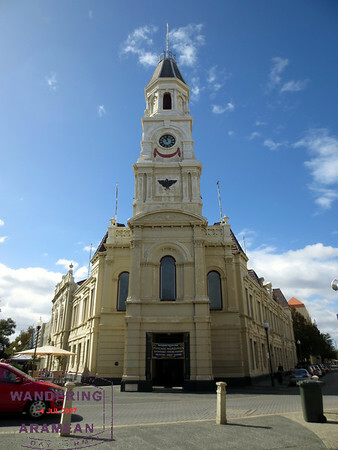 Fremantle is home to the oldest standing public building in Western Australia, the Round House. 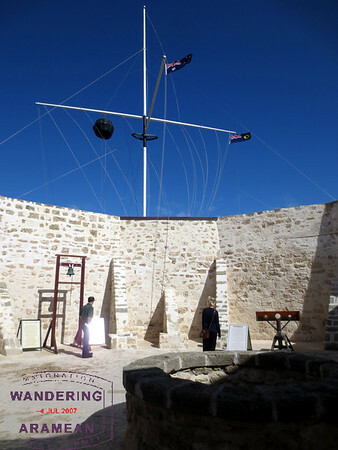 It was originally built as a prison to hold locals caught out after curfew in the early days of the settlement. Today it sits atop a bluff over the beach with some rather impressive views. At one point mid-morning I started to get a bit stir-crazy, hoping to see more of the area. The weather was a bit cool for all but the most dedicated beach-goers but I was interested in seeing what was on offer anyways. I headed up the coast to Cottesloe to check out the beaches there as well. 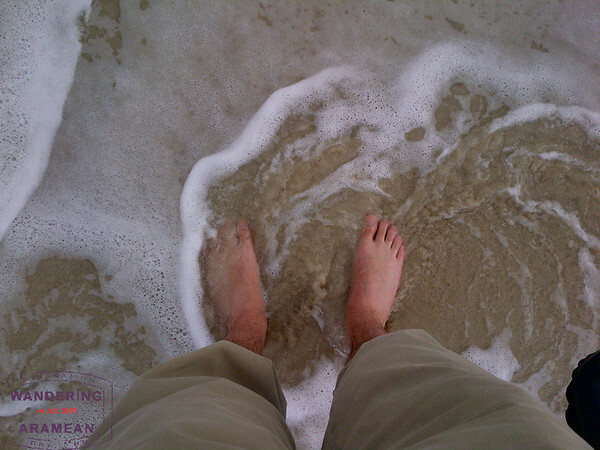 I had the opportunity to dip my toes in the water and I also saw dolphins swimming just off-shore. Not bad at all. As the day wore on I realized that I had a few more pressing needs than additional sightseeing. I had a bit of work I needed to get done (not a great time to discover corruption in the database behind one of your websites) and I was also desperately in need of a shower. I ducked in to a hostel on the main drag in Fremantle and for AUD$10 I had access to all the facilities, including the internet connection and the shared bathrooms. Quite a reasonable price to pay for getting cleaned up and a base to run from for a few hours. By this point it was getting close to both sunset and to my dinner reservation time. I packed up and headed back up the coast, hoping to catch a glimpse of the sunset. I was not disappointed. From there it was in to town where I finally saw Perth proper. Some tall buildings, quite a bit of construction along the waterfront and a casino where we had dinner. I must say that the locals – particularly the women – got very dressed up to go out to the casino on a Saturday night. Maybe there is more to see in the CDB of Perth; if there is, I missed it. But I had a great time out on the waterfront all day. Not a bad transit stop at all. More stories from the trip here. Please write about the RGN transit for those of us who have that coming up . . .
Will do, Bill. I forgot that I hadn’t written that part until I was mostly done with this one. I ended up not clearing immigration but it took about 2 hours to sort everything out. Of that time, I spent about an hour without my passport. It was interesting, to say the least. The idea of Yangon as a transit airport boggles the mind! I know this to be picking at nits, but one goes “toward” something, not towards, just as “anyways” has become the new anyway. Why do we not say “forwards”, but do say backwards? I dearly would prefer having our language remain somewhat pure. Otherwise, I like your style. Nice re-cap of your stop in Perth. Agreed that for the short time you’re on the ground you saw the basic spots, Fremantle and my favorite ‘city’ beach of Cottesloe. Good pics, especially the corkscrew! Thought this article from Wall Street Journal might be of interest to you. Talks about award availability on various airlines.